Many thanks to Gareth Holdsworth for taking and donating the photo of the plaque. Tamnamore L.O.L. 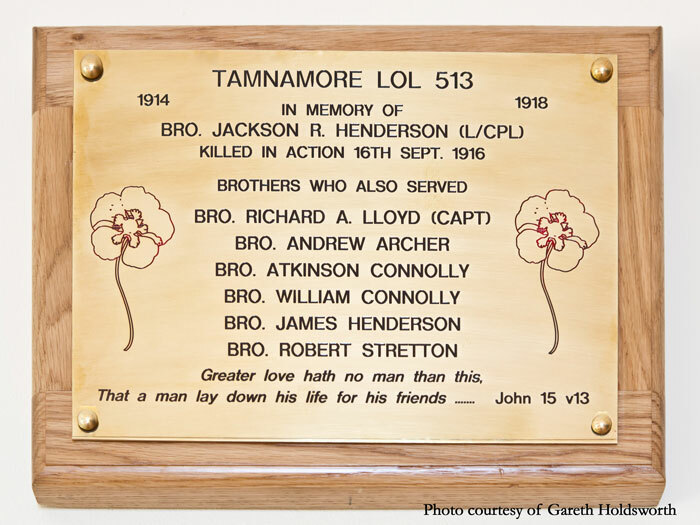 513 World War One Memorial is located in Tamnamore Orange Hall. Tamnamore Orange Hall was built in 1896. The Lloyds family started this lodge in their own home. The first master was Lindsey Lloyd. The second master was Thomas Harrison. Stewart Bros from Tartalaghan were the builders. The hall was rebuilt in 1972.